Martin, 1986, 1990, 1993; Szalay and Delson, 1979; Szalay et al., 1987; Wible and Covert, 1987). 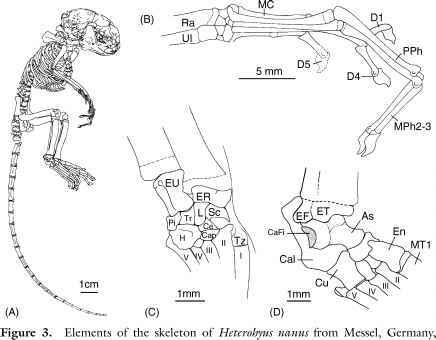 Compared to basal euprimates and strepsirrhines, anthropoids are further derived in possessing an orbital cavity largely walled off from the temporal fossa by a bony postorbital septum. Therefore, information on circumorbital function in strepsirhines, and by inference basal euprimates, is of added importance for understanding the origin of anthropoid cranial adaptations. The purpose of this chapter is to review personal work regarding the functional significance of the postorbital bar and circumorbital region. In particular, we address two long-standing and influential hypotheses regarding the primary function of the euprimate postorbital bar: (1) that it resists facial torsion associated with masticatory stresses transmitted across the temporal fossa from the maxilla to the braincase during unilateral molar chewing and biting (Greaves, 1985, 1991, 1995); and (2) that it provides rigidity to the lateral orbital margins in order to prevent excessive ocular movements and thus maintain a high degree of visual acuity during nocturnal predation on small vertebrates and invertebrates (Cartmill, 1970, 1972). To test the facial torsion model, we analyzed in vivo bone-strain data so as to determine mandibular and circumorbital loading patterns in representative primates with a postorbital bar and masticatory apparatus similar to the first modern primates (Ravosa et al., 2000a-c). To investigate the nocturnal visual predation hypothesis (NVPH), we collected metric data on orbit orientation in living and fossil euprimate sister taxa, 12 strepsirrhine, and anthropoid postnatal growth series, as well as several clades of mammalian visual predators and foragers that vary interspecifically in postorbital bar formation (Noble et al., 2000; Ravosa et al., 2000a,b; Ravosa, unpublished). By integrating and evaluating experimental, comparative and ontogenetic evidence in a phylogenetic framework, we then attempt a more comprehensive characterization of adaptive transformations in skull form during the origin of Euprimates (cf., Cartmill, 1972, 1974, 1992; Fleagle, 1999; Martin, 1990, 1993; Rasmussen, 1990; Sussman, 1991).